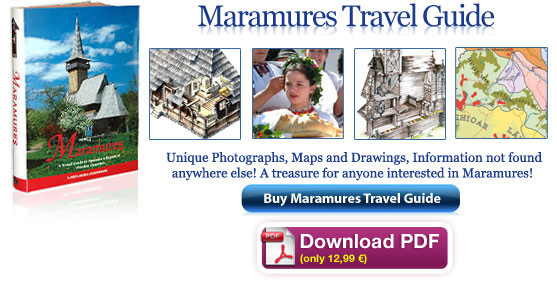 Summary: The Graeco-Catholic church of the Holy Archangels is one of a handful of Maramures churches with a unitary roof that covers the whole building. The impression received is that the church is very long, which is enforced by the rather short tower. The Church of the Holy Archangels in Breb seen from southwest seen from southwest. It is easy to notice that the porch was added at a later stage. 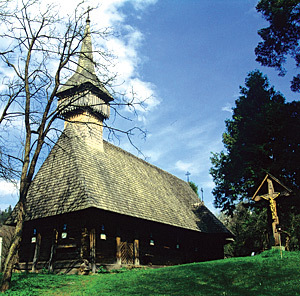 The church was probably built at the end of the 17th century, as its original form with the entrance on the south façade is an indication of its age. 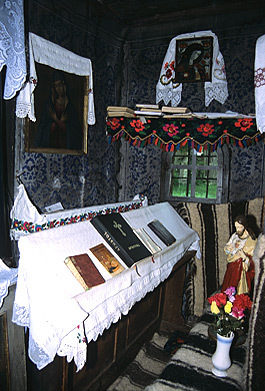 Now, in the place of the first door is a window, but the old frame carved with crosses is still in place. The porch was added in 1845, and the entrance was moved to the west façade. The enlarged semicircular windows are framed with carved scrolls. The east apse window is unique: four arrowhead-shaped slits pierce one of the logs forming the St. Andrew’s cross. 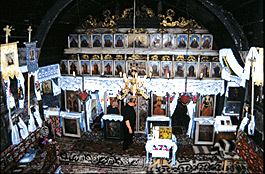 A general view of the naos and the iconostasis from the balcony. 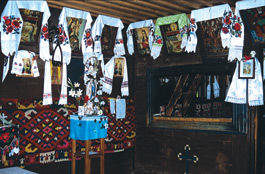 The walls of the pronaos are covered with icons and embroidered towels, very much like in a traditional house. 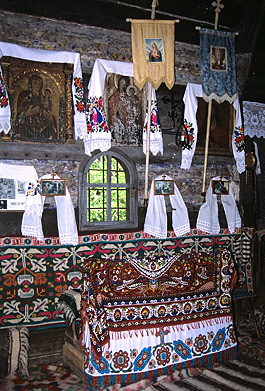 The pews are covered with colourful carpets. One of the two lateral apses of the naos.